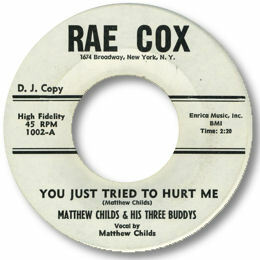 This is deep voiced Childs’ only known 45 issued by New York’s Rae Cox label in 1963. Taken at a funereal pace You Just Tried To Hurt Me is a song of considerable pain well suited to Childs’ big uncomplicated vocal. The out of tune horns bravely try to assist the process. UPDATE ~ My friend Michel has spotted another disc by Matthew Childs now shown in the discography above. I'm grateful to him as always.